Before we had kids, Josh and I bought our first Disney movie: The Emperor’s New Groove. I love that movie. In typical Disney fashion, the movie opens with a grandiose musical number. Emperor Kuzco, a spoiled young monarch, is dancing around his palace displaying his wealth and power. Halfway through the scene, Kuzco bumps into an elderly peasant man. The music immediately stops, the Emperor throws a fit, and a guard enters. I’m sorry, you’ve thrown off the emperor’s groove. The elderly offender is immediately thrown out a window and the music begins again. As the story progresses, Emperor Kuzco is turned into a llama by his former advisor, Yzma. Kronk, Yzma’s be-muscled sidekick, fails to properly dispose of the llama/emperor, and Kuzco spends the remainder of the movie trying to regain his throne with the assistance of a llama herder named Pacha. Emperor Kuzco thinks he is the perfect leader. He is deluded, and believes that everyone in his domain worships him. He is in his groove. He’s doing what he was born to do. Then life intervenes. He’s forced to step outside of himself and look at what’s really going on. It’s in that moment that he realizes his groove is really a rut. No one has the nerve to tell him how he needs to change, and he doesn’t see anything wrong with the way he’s been doing things. He’s been blissfully ignorant as he traveled his usual course, and doesn’t understand why anyone would feel differently. I have this same tendency. Life falls into a routine. If we’re not intentional about our decisions, actions and habits we can easily end up following the same path around in circles. Reading the same books, watching the same shows, interacting with the same friends. Comfortable, familiar, and safe. Then God intervenes. He shakes things up. Our normal path suddenly has a fork in the road; we must make a choice. Continue on in the way we were going, or see where He leads? There could be bends, steep inclines and unfamiliar terrain; there could be waterfalls, rope bridges and wild animals. Following Him out of your rut can restore newness to your relationship with Him. Discover fresh talents, learn hidden truths, hear the stories of those around you that previously you’d passed by. I would encourage you today to desire Him to shake up your routine; to throw of your groove. If you’ve seen the movie, you know that Kuzco ended up a better emperor for it. Where have you fallen into a rut in your life? Have you sensed God trying to shake things up? What’s your favorite Disney movie? Regarding groove/rut: I think you’re spot on. Often I get stuck in the same rut like you said (same books, same passage of scripture, same people I hang around), and it’s not until God shakes things up a little where a fresh perspective comes into my life. Sometimes its unexpected (and I have an “aha” moment), and sometimes its even painful (dealing with a sin issue or some other situation), but either way as I seek God during those times my faith is always refined. Thanks for sharing, Melissa! Dustin, I have seen photos of your family in your blog (and FB) and your wife does have a slight resemblance to Jasmine from Aladdin. Amazing! However, you look nothing like Aladdin (sorry buddy). I’ve fallen into a rut by trying to create a formula with my relationship with God. I think about my relationship with the people I love and it is so dynamic. We don’t do the same thing every day. It’s always different and fresh. I’m working on doing that with my relationship with the Lord. Favorite Disney movie? The Little Mermaid. Don’t judge me or I will stab you with a dinglehopper. This is definitely one of my favorites of yours Melissa. Such kind words, Tony! :) Thank you, I was feeling a tad silly about posting on a children’s movie. Haha! Your words encouraged me today. it’s been so long since I’ve seen the Herbie series, so I can’t pinpoint a favorite one. but I love Herbie. and God has definitely been trying, somewhat successfully, to shake my life out of the rut I let myself fall into. i still have quite figured out why it works for me, but part of the grading involved switching from my Pentecostal faith background to attendance at and confirmation in the Anglican Church. Now that I’m leveling out in my relationship with God, he is beginning to stir my callings. Maybe it been more successful than I think. From Pentecostal to Anglican…that is definitely shaking things up! I’d love to hear more about this change, Douglas! You’ve definitely sparked my interest as well. :) I have some friends who made somewhat of the same transition; it’s interesting to hear what motivates it. :) Christy and I just watched tENG on Sunday night. What’s funny is that, even though it’s one of my favorites, I had never made the connection between the old “Emperor’s New Clothes” and “the Groove” until you drew me a picture. I had thought vaguely about it, but never made the full connection that his Groove was the thing that was horribly wrong but nobody would stand up and tell him except someone simple. I read this post in the midst of much self-evaluation in my Seminary classes. There is a big focus on basically “finding your groove” with God – knowing your talents, knowing your personality, etc… I fully agree with the value of finding congruence between who God has made you and who God has called you to be, but I REALLY like that you drew out how Kuzco was really good at his Groove, he was born for this. The problem was that he had found something that suited him perfectly, but didn’t groove with ANYONE else. Our goal is not to simply know ourselves and what we are good at, but to know God and let Him show us what we’re made for. This is kind of a pet peeve of mine in the church. We do strengths/ giftings/talent/calling (whatever you want to call it) tests based on our history, passions and experiences in order to pinpoint the exact area within the church we should be working. I am obsessed with tests that will tell me who I am, what I should do, and why I act the way I do. However, I have found that there are times I look to those tests more than I listen to God. Has anyone ever taken a test that tells them they should be the church janitor? Who’s gift is setting up chairs before the service? Don’t get me wrong, it’s good to discover the places that you’re suited to, because no one is helped by someone begrudgingly volunteering. I just think that sometimes God calls us to do things that we don’t see as a gifting. Or, as in the case of Kuzco, our living out of that calling hurts others. It’s good to be a peon to learn how to be an effective leader. I get super annoyed by those “tests” too! And, hello, my educational background is psychology, so I’m not supposed to say that. I just think they are so limiting! What I think they are good for is exploring our strengths and weaknesses, not allowing them to define us. This is why I pretty much abhor The Five Love Languages! UGHHHHHHHH If one more person asks me what my love language is, I might just scream. Wow, that is so true. For example, I have never been a huge fan of children (which you wouldn’t know, since I have four now), I just didn’t know how to relate to them aside from my own son, had no desire to get involved with other people’s kids in any way. The experiences I’d had with babysitting were frustrating and I finally decided that I just didn’t have that special “thing” that makes a great childcare worker. And then I felt God nudging me toward Kids Church. We argued. I kept telling him that I wasn’t good with kids, and He kept not worrying about that part. Guess who won? When I finally allowed God to drag me kicking and screaming into teaching the preschool class, I remember saying, “Fine, but you have to help me, because I have zero patience and no natural inclination for this work.” You can probably finish the story for me. God showed up. I stretched and grew and had the time of my life. I loved it. I had to pray for wisdom, patience and understanding every week, and He never failed me. So now I know, not just from hearing it in church, but I really know, when God calls you to do the impossible, He will make it possible. Have either of you ever heard Beth Moore talk about her past and her childhood? That is some powerful evidence of God calling the unqualified so that His glory would be shown. I haven’t. I don’t really know that much about Beth Moore, really just that people either seem to love her or hate her. Haha! I do have a couple of bible studies by her that I have yet to do. I’ll have to go check that out. I fallen into a rut when I realize that everything becomes a routine. It stops feeling good and becomes “religion”. Wake up at the same time, do the same things and call it “serving God”. I have to admit that the times when I’ve been taken out of my routine is the time that I sense more excitement, more opportunity and feel closer to God. Go figure. I’m not a big fan of Disney movies (though I’ve seen a few). I would have to say my favorite is Tangled. Yeah, I know… Maybe it’s because I actually enjoyed a movie with my daughter… it was special (the moment) and the moive was really good. I love this movie! (Although my favorite Disney movie is Beauty & the Beast.) God is currently breaking me out of an overweight/unhealthy rut. And it’s kind of shaking up my whole life. I like it – but it’s HARD! Mary! Why did you have to call me out on my rut?! :) I have sensed God doing much the same in my life. It is such a difficult rut to climb out of, because it’s so comfy, but it definitely shakes up the entire life. Praying for you in that! i was forceably moved out of the rut i unknowingly had landed in. and while i am a woman who continues to be changed and transformed because of it, more days than not, that rut seems far more comfortable than my current reality. and while i hate that, i see and recognize the truth that the Lord needs to not only show us how to groove, He needs to become our groove. so i am trying to learn how to dance. . .how to feel and move. praying that He will teach me the choreography to this new life i never wanted or planned for myself. . .believing that He already knows the finale and the steps it will take to get there. . .
. . .love this. love you. . .
Aw, shucks, Lauren! :) Thanks. And I love your words! “…the Lord needs to not only show us how to groove, He needs to become our groove.” So true. And much like in dancing, there’s a person who leads and one who follows. Thank God He’s our leader, because I would just keep stepping on everyone’s toes. Haha! Isn’t that the truth. 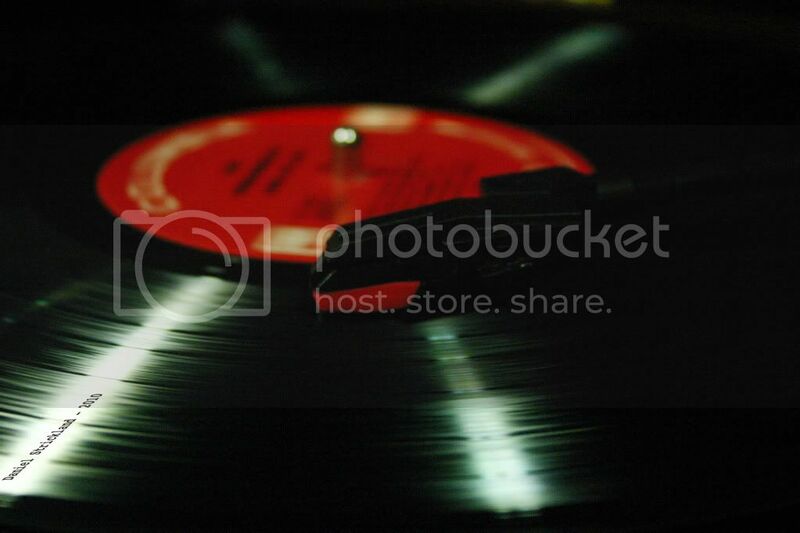 Much like the record picture above, it’s easy to skip back and forth and not make much music. Thanks, Jennifer!